Entryways offer us first glimpses into a home. It’s where we welcome guests and in some cases store such things as coats, purses, keys and mail. 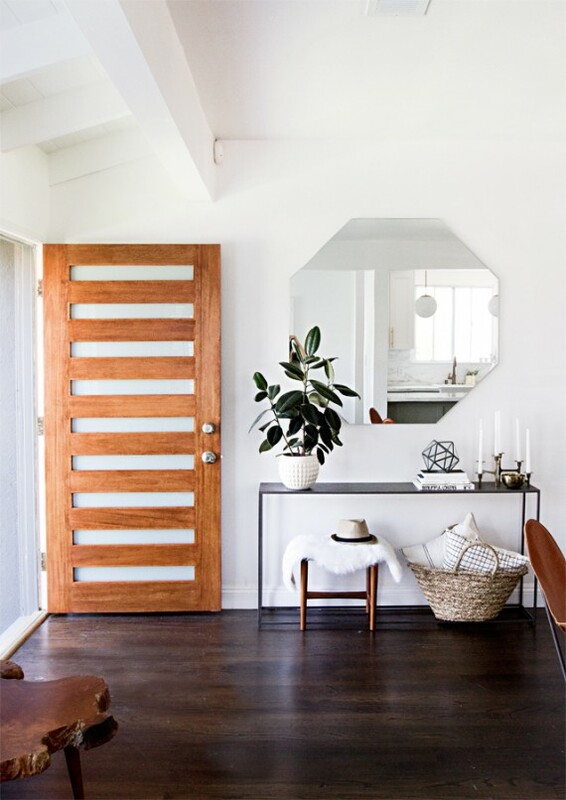 Entryway design takes planning if you want to it to be both beautiful and functional, so I’ve rounded up a few fabulous entryways that do both. 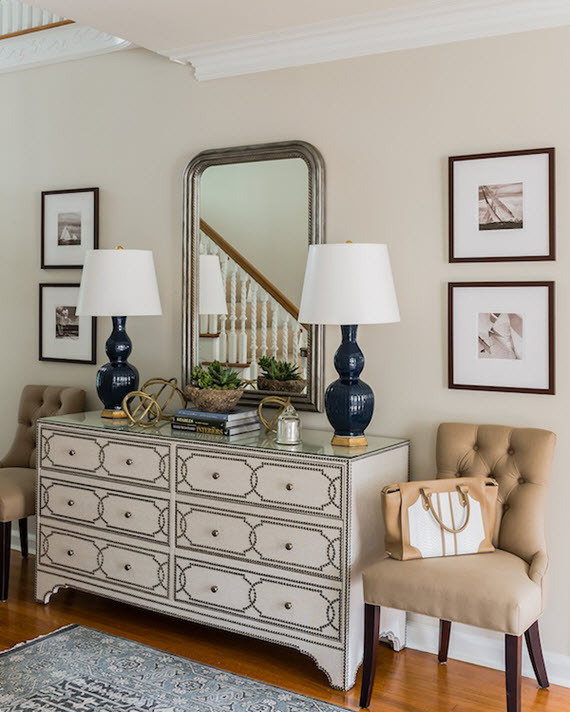 Loving this elegant entryway by Erin Gates Design of Elements of Style. The linen wrapped dresser with nailhead detailing is a head turner! Sarah Sherman Samuel of Smitten Studio (say that 5 times!) nails it here with modern and contemporary elements – console table, geometric mirror, stool and basket storage. Love! Simple, yet sophisticated entry. Love the use of white. Design by Anisa Darnell via HGTV. Perhaps one of my favorite entryways of the bunch. This one I spotted on Pinterest – I was drawn it’s elegance and chinoiserie touches. 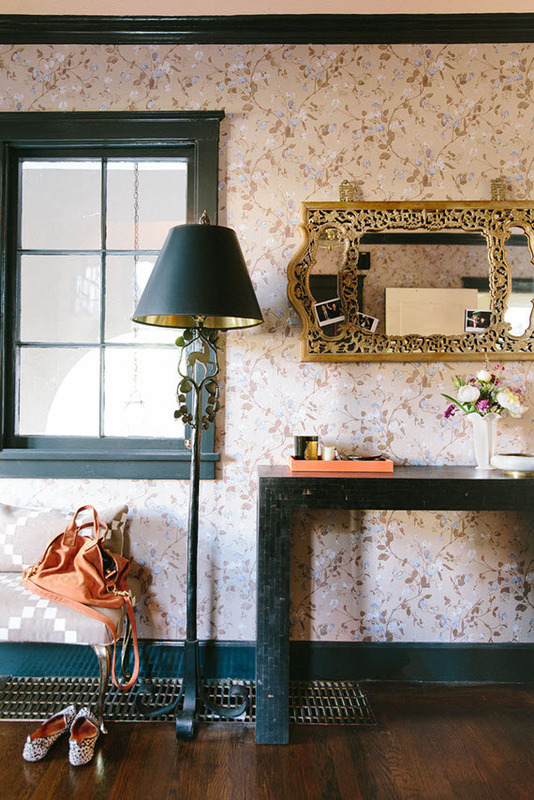 Speaking of chinoiserie touches, here’s another fabulous entryway by Chloe Warner via Lonny. It’s on the small side, but so chic and functional! Love the mix of masculine and feminine, pattern and color too. Need more entryway design ideas? The second one is my favorite. I like the modern approach. Great job on the article and great pics! Entryways can be very challenging. You have chosen a nice variety of options. I definitely agree with you, if your entryway isn’t a place you can settle down when you walk in, it feels very unfinished. My partner and I have a new apartment that enters into the living room and there’s no real space for a table or real entryway and it bums me out. I have no wear to always set my purse, sunglasses, or keys… At least somewhere I’ll consistently set them! My personal favourite is the last one designed by Chloe Warner. However, the other entryways look graet, too. Thanks for sharing, Cristin! Thanks Abby! Love Chloe’s design too.